Coal has helped power America for decades. It’s also a main contributor to global warming, and has major negative effects on human health and the environment. But despite providing more than half of the United States’ electricity between 1981 and 2008 , electricity generation from coal is declining—largely replaced by another fossil fuel, natural gas, and by clean energy alternatives like wind, solar, and energy efficiency. Prolonged heat and pressure help form different types of coal. Coal is formed when dead plant matter submerged in swamp environments is subjected to the geological forces of heat and pressure over hundreds of millions of years. Over time, the plant matter transforms from moist, low-carbon peat, to coal, an energy- and carbon-dense black or brownish-black sedimentary rock. Coal itself has a wide variation in properties, and can be categorized into four main types, or ranks—lignite, sub-bituminous, bituminous, and anthracite—in order of increasing carbon and energy content. Most of the coal burned in US power plants is bituminous or subbituminous coal. A fifth type, called metallurgical (or “coking”) coal, is used for steelmaking. In the United States, the sulfur content of coal varies along geographic lines, with most—though not all— eastern coal containing high levels of sulfur, and western coal containing much less. In 2016, the United States burned roughly 728 million tons of coal, enough to fill a typical railroad car every 4 seconds . The electricity sector accounted for over 90 percent of all coal used in the United States, with the rest burned in industrial and commercial settings. All this coal comes from mines, which are either underground or above-ground (“surface”). Both forms carry serious ecological impacts, and both are considered extremely dangerous: underground mining remains one of the United States’ most hazardous occupations, killing dozens of miners every year. Two dominant methods account for the vast majority of underground coal mining: “room and pillar” and “longwall” mining. In room and pillar mining, seams of coal are partially mined, leaving large pillars of coal intact to support the overlying layers of rock. When finished, miners practice “retreat” mining, extracting as much coal as possible from the remaining pillars as they reverse their way out, allowing the roof of the seam to collapse. Today, both room and pillar and longwall mining are performed with very powerful mining machines, which rapidly cut coal from the face of coal seams. These machines have gradually replaced less productive and more dangerous methods, which require intermittently drilling the coal seam and blasting it with explosives. A strip mine in Wyoming. Strip mining is used when coal seams are located close to the surface. It relies on very large machinery and requires many fewer workers per unit of coal. First, vegetation and soil are removed from the immediate surface. The large intermediate layer of sediment and rock, referred to by the industry as “overburden,” is then blasted and removed, either by a process called “draglining” or in large truckloads. Once exposed, the underlying coal seam is removed in strips and transported away by conveyor belt or truck. By law, strip mine owners are required to restore and replant affected areas, though successfully reclaimed acreage is relatively low when compared to acres of newly-mined land . A 2016 study found that mountaintop coal mining caused parts of Central Appalachia to be 40 percent flatter than they were forty years ago. An evaluation of 434 stream mitigation projects in Appalachia showed that compensatory mitigation is not sufficient in restoring degraded ecosystems. Studies have shown that children born close to MTR mining areas suffer a 42% increase in birth defects and that the public health costs of pollution from coal operations in Appalachia amount to a staggering $75 billion a year. While coal mining has long caused environmental damage, the most destructive mining method by far is a relatively new type of surface mining called mountaintop removal, or MTR. Currently practiced in southern West Virginia, southwestern Virginia, and eastern Kentucky, MTR requires stripping all trees from a mountaintop and blasting away the top several hundred feet with explosives. The resulting debris is then dumped into adjacent valleys, burying streams and severely—and irrevocably—impacting local environments. Mountaintop removal mines leave behind flattened areas with soils so poor they can only support exotic grasses, displacing diverse and ecologically important forested ecosystems. Impacts include ecosystem loss and fragmentation, higher risks of local flooding and runoff, contamination of local groundwater resources, and occasional deadly accidents. In Central Appalachia alone, coalfields cover 48,000 square kilometers (approximately 10.7 million football fields) of Appalachian mountain tops and valleys, displacing existing Appalachian forests and polluting or burying more than 4 percent of the region’s streams . A map of coal fields in the United States. While coal is currently mined in 25 states, the main sources of US coal are highly concentrated. In 2016, almost 58 percent of all the coal produced in the United States came from just three states—Kentucky, West Virginia, and Wyoming—with each contributing 6, 11, and 40 percent of US coal production, respectively . In 1950, underground mines, most of them in Appalachia, produced 421 million short tons, or 75 percent of US coal. Surface mining has since overtaken underground mining, accounting for 64 percent of production in 2016. In 2016, the largest single source of US coal was Wyoming, with most of it coming from the enormous Powder River Basin . Even though Wyoming produces much of the nation’s coal, the state employed only 5,756 coal miners in 2016, or 11 percent of the nation’s 51,795 miners. This reflects the large-scale operations of surface mines, which require much fewer employees. West Virginia, by contrast, employed 11,561 miners in 2016, or 22 percent of the nation’s total. More coal is produced from west of the Mississippi than anywhere else in the country. Although lower production costs influenced this transition, so did the coal’s sulfur content. The Clean Air Act, especially after amendments passed in 1990, drove a shift toward low-sulfur coal as one of the main methods of reducing sulfur dioxide emissions from coal plants. 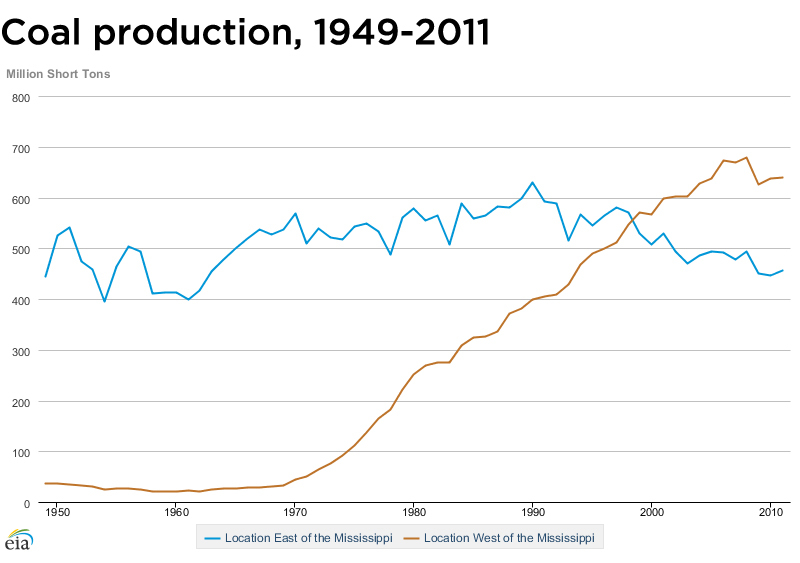 Since the predominantly subbituminous coal west of the Mississippi emits much less sulfur per unit of energy, this trend favored western surface mines as a dominant source of new coal production. It also increased the use of mountaintop-removal mining in Central Appalachia for the same reasons—a classic example of unintended consequences. The nation's worst ever black water spill happened on October 11, 2000, near Inez, Kentucky. Just after midnight, 306 million gallons of coal sludge, laced with coal cleaning chemicals and the heavy metals present in coal, leaked from a coal slurry impoundment at a Martin County Coal Company mountaintop removal site. The sludge streamed into an underground mine before bursting out two exit portals into two nearby creeks. Thirty times more liquid were released than the Exxon Valdez accident. Before coal is shipped long distances, it undergoes a process of preparation to lower shipping costs and prepare it for use in power plants. Preparation generally includes crushing the coal and removing heavy, extraneous non-coal materials. If coal is high in sulfur or other impurities, it is washed with a water or chemical bath, removing up to 40 percent of inorganic sulfur in the coal. Not all coal is prepared using the same process. High-sulfur coal commonly undergoes washing to meet environmental regulations, while low-sulfur coal is often crushed and resized without being washed. Unfortunately, the contaminants and non-coal material removed during washing must go somewhere, and are typically left in large wastewater ponds, known as “slurry” reservoirs or impoundments. There are over 700 such reservoirs in Appalachia alone, holding hundreds of millions of gallons of mine waste. Contaminants from these reservoirs can easily leach into surface and groundwater supplies; in extreme cases, the dams holding these reservoirs can fail, flooding local waterways and putting both wildlife and downstream communities at risk. The volume of waste from processing coal can be substantial; 35 – 40 percent of the raw coal going into a typical washing plants was left behind as waste in 2010 . About thirty percent of US freight train traffic comes from coal. Because coal is only mined in a few regions of the country, it typically needs to be transported before being burned in a power plant. Wyoming’s Powder River Basin coal, for example, is shipped by rail to power plants as far away as Georgia. Trains move roughly 70 percent of the coal that’s transported in the United States every year . Barges and trucks move another 11 percent, with the rest delivered mainly by tramway, conveyor belt, or slurry pipeline. To give a sense of scale: coal accounts for about one-third of all US freight train traffic. These trains, as well as the trucks and barges, run on diesel—a major source of air toxins, nitrogen oxide, and soot. A common method for lowering transportation costs is to build power plants directly adjacent to mines, using conveyer belts to move the coal. These so-called “mine mouth” plants then require long distance electricity transmission lines. In 2012, 37 states were net importers of coal and 82 percent of the imported coal originated from just three states (Wyoming, West Virginia, and Kentucky) . A 2014 UCS study showed how importing coal caused these 37 states to send billions of dollars out of state, instead of investing the money in local economies. Almost all coal plants operating today use “pulverized coal” (PC) technology, which involves grinding the coal, burning it to make steam, and running the steam through a turbine to generate electricity. A newer technology known as integrated gasification combined cycle (IGCC) converts coal into a gas, runs the gas through a combustion turbine to generate electricity, and uses the excess heat from that process to generate additional electricity via a steam turbine (hence the term “combined cycle”). Sulfur dioxide, which leads to acid rain. Coal combustion is the leading source of US sulfur dioxide emissions. Nitrogen oxides, key contributors to ground-level ozone (smog) and respiratory illnesses. Particulate matter (soot), which produces haze and can cause chronic bronchitis, aggravated asthma, and premature death (both sulfur dioxide and nitrogen oxides transform into particulates in the atmosphere). Mercury, a neurotoxin that can contaminate waterways, make fish unsafe to eat, and cause birth defects. As with sulfur dioxide, coal burning is the leading source of mercury emissions in the United States. Hydrocarbons, carbon monoxide, volatile organic compounds (VOCs), arsenic, lead, cadmium, 8and other toxic heavy metals. After the coal is burned, the remaining ash and sludge is often disposed of in unlined and unmonitored landfills and reservoirs. Heavy metals and toxic substances contained in this waste can contaminate drinking water supplies and harm local ecosystems, and failed reservoirs can flood coal waste into surrounding areas. Of the many environmental and public health risks associated with coal, the most serious in terms of its universal and potentially irreversible consequences is global warming. The scientific community has reached an overwhelming consensus that Earth’s climate is warming—with potentially devastating future impacts—and that human activities such as the burning of fossil fuels and deforestation are largely to blame. Global warming impacts include seal level rise and coastal flooding; more frequent and intense heat waves; and widespread ecological damage, including forest death and species loss, among others. Coal-fired power plants are the largest single source of CO2 emissions in the US power sector, and accounted for 24 percent of all energy-related carbon dioxide emissions in 2016 . China, India, and many other industrialized nations rely on massive reserves of coal for power production. Despite taking important steps to improve its energy efficiency and invest in renewable sources of power, China has passed the United States in annual CO2 emissions, and could expand its coal production much further. These trends underscore the need for the United States to invest in low-cost alternatives to coal and increase their availability internationally. A portion of existing plants and all new ones offer some pollution control technologies to reduce their emissions, especially sulfur dioxide and particulates. Common pollution control methods include scrubbers and filters. Scrubbers use a wet limestone slurry to absorb pollution as it passes through. Filters are collections of large cloth bags that catch particulates as they travel through the cloth. Smaller particulates are less likely to be absorbed, and can pass out the smokestack into the air. 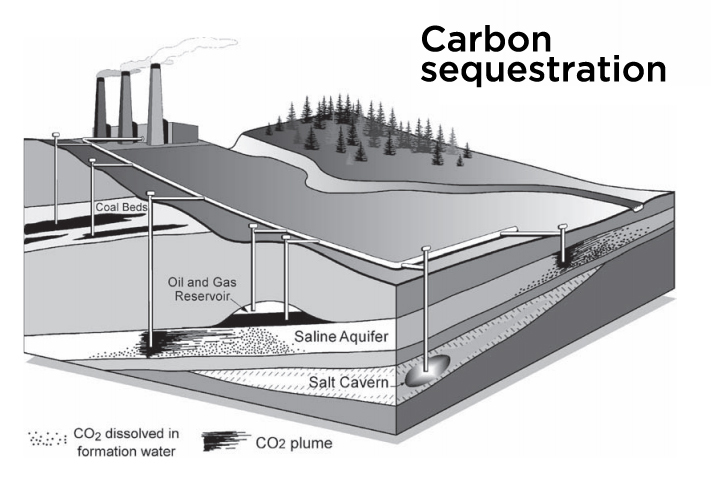 A diagram of how geological sequestration of carbon dioxide works. IGCC technology is more expensive than pulverized coal technology, but offers certain environmental advantages. While modern pollution controls for nitrogen oxides, sulfur dioxide, and particulate matter can dramatically reduce emissions from pulverized coal plants (by 90 to 99 percent), IGCC plants are capable of even greater reductions. It is also easier and less costly to capture and dispose of mercury from an IGCC plant than from a pulverized coal plant, which became increasingly important after mercury restrictions came into effect in 2011 . At the moment, commercially available control technology that can be added to coal plants to reduce their CO2 emissions is expensive. However, carbon capture and storage (CCS) is an emerging technology that may allow plant operators to capture CO2, transport it to a “geologic sequestration” site, and pump it into the ground for permanent storage. With respect to capturing carbon, IGCC has an additional advantage over pulverized coal technology. Since its gasification process allows for the separation and capture of CO2 before combustion, the gas is still in a relatively concentrated and pressurized form. Pulverized coal plants can only capture CO2 after combustion, when it is far more diluted and harder to separate, increasing the costs of implementing CCS. Pre- and post-combustion technologies are both expected to capture between 85 and 95 percent of a plant’s CO2. However, capturing and compressing CO2 is a very energy-intensive process, causing large reductions in the amount of net energy the plant is able to produce. State-of-the-art methods for capturing CO2 from pulverized coal plants are expected to reduce the plant’s energy output by a quarter or more (assuming CCS is built into the original plant design and not added as a retrofit, in which case it would reduce power output even more). Although the output loss for IGCC plants would be smaller, reductions greater than 15 percent are still expected. When factoring in the likely additional fuel used to power the CO2 removal process, the actual amount of CO2 avoided per unit of electricity would fall to the 80 or 90 percent range . UCS supports continued federal incentives for CCS research, as CSS technology will play an important role in transitioning to a clean energy future. The number of US coal miners fell dramatically over the twentieth century. Hard hat-clad men and women, deep underground, working to keep America’s lights on: it’s an image burned into our national imagination. At one point, there were many hundreds of thousands of people working in the coal mining industry in the United States, often located in rural communities where mining presented the best opportunity for a decent, stable income. But thanks to mechanization, increases in efficiency, and a shift toward less labor-intensive strip mining, employment in the coal industry dropped throughout the latter half of the twentieth century, even as production continued to increase steadily. Today, the entire coal industry—including mines and power plants—employs roughly 160,000 people. For scale, the solar industry provides 374,000 jobs in the US, with most of those people—261,000—working on solar at least half time. But employment numbers don’t tell the whole story. More men and women have died in American coal mines than all the Americans who died in Vietnam, the Gulf War, and the Iraq war combined. Black lung, asthma, cancer, and other debilitating conditions disproportionately affect coal communities; so do neurological disorders, developmental problems in children, and other issues caused by air pollution. Coal is on the decline. In 2011, the top four coal companies were worth a combined $34 billion: by 2016, they were valued at $150 million . As carbon dioxide becomes more important to regulate and restrict—and absent successful carbon capture and sequestration technologies—coal production will likely continue to decrease. The reasons for coal’s decline are structural, not cyclical. Aging coal plants, the cheap price of natural gas, and the environmental impacts of coal and the regulations to mitigate these impacts are all major contributors. Wind and solar technologies are also increasing cost-competitive and will continue to displace coal’s market share. But even with the coal industry’s decline, the United States is still projected be one of the top three coal consuming countries, along with China and India . Given the urgent need to reduce greenhouse gas emissions—and given coal power’s enormous contribution to those emissions—UCS is committed to reducing America’s reliance on coal and simultaneously investing in America’s coal communities. Decreasing coal consumption will decrease emissions, and improve public health, reduce environmental impacts, and lead to a cleaner and stronger US economy. Energy Information Administration. 2016. Annual Energy Review. Table 8.4b Consumption for electricity generation by energy source: electric power sector, 1949-2011. Energy Information Administration. 2016. What is the U.S. electricity generation by energy source? Energy Information Administration. November 2017. Annual Coal Report 2016. Energy Information Administration. January 26, 2015. Coal Mining and Transportation. Yoginder P.C. and P.T. Behum. 2014. Coal waste management practices in the USA: an overview. Int J Coal Sci Technol (2014) 1: 163. https://doi.org/10.1007/s40789-014-0023-4.